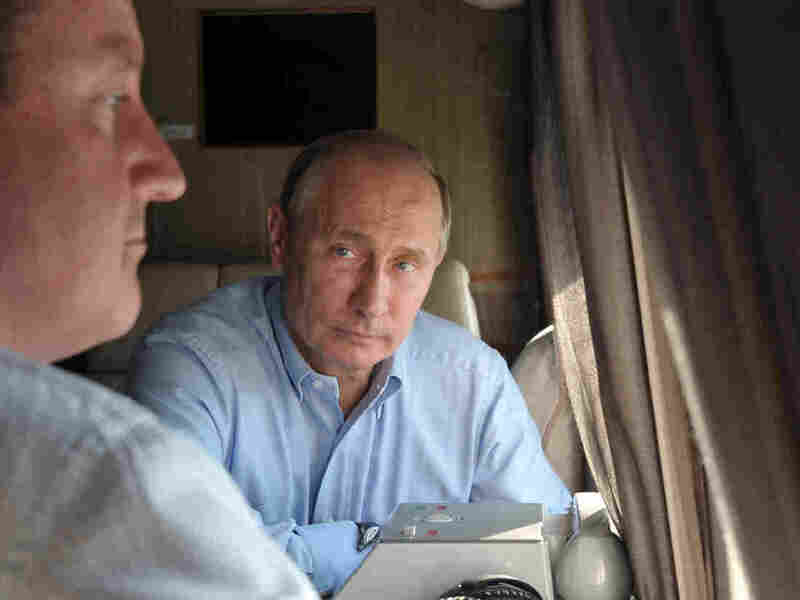 Report: An Angry Russia Will Deliver Missiles To Syria : The Two-Way Although the European Union is lifting its embargo, EU nations say they do not now have plans to send arms to those fighting the regime of Syrian President Bashar Assad. Still, Russia is critical of the decision and says it will follow through on plans to send additional arms to Assad's military. Russian President Vladimir Putin (right) and British Prime Minister David Cameron met earlier this month. Cameron said then that he was encouraged by Russia's willingness to take part in a peace conference on Syria. Now, Russia is said to be angry about the EU's decision to lift an embargo on arming the Syrian opposition. The European Union's decision to end its embargo on arming the opposition in Syria has been followed by sharp criticism from Russia's foreign ministry and word that Russia will follow through on plans to deliver anti-aircraft missiles to President Bashar Assad's military. According to the BBC, "Deputy Foreign Minister Sergei Ryabkov said the [Russian] missiles were a 'stabilizing factor' that could dissuade 'some hotheads' from entering the conflict." Russia has been one of Assad's few foreign friends since protests against the Syrian president's regime began in March 2011 and during the sectarian civil war that has followed. As NPR's Corey Flintoff reports from Moscow, Russia says the weapons it has delivered and the missiles it will be sending are part of arms deals that were signed before the conflict began. From London, NPR's Philip Reeves says Russian diplomats believe the EU's decision undermines the chances of a possible peace conference aimed at ending Syria's civil war. From Moscow, Corey adds that "Russia's foreign ministry acted as if the Europeans were sabotaging Russian and U.S. efforts to bring the warring parties to the bargaining table." Just two weeks ago, British Prime Minister David Cameron was hailing Russia's agreement to take part in such peace talks. That was "a real breakthrough," Cameron said. Though EU ministers have agreed to end their nations' embargo on arming the Syrian opposition, British Foreign Secretary William Hague said Monday that his nation has "no immediate plans to send arms to Syria." The Associated Press adds that "no other EU member appeared to have immediate plans to send arms to the rebels." "Israel's defense minister on Tuesday signaled that his military is prepared to strike shipments of advanced Russian weapons to Syria, in a rare implied threat to Moscow," The Associated Press reports from Jerusalem. "Defense Minister Moshe Yaalon issued his warning shortly after a top Russian official said his government reserves the right to provide Syria with state-of-the-art S-300 air defense missiles." -- In Damascus, A View Of Syria's War Turned Inside Out. -- McCain Meets With Rebels In Syria.